Shatavari is one of the prime rejuvenating herbal medicines in Ayurveda. The name translates to "she who possesses 100 husbands", referring to the herbs rejuvanitive effect upon the female reproductive organs. It is also effective in a number of other systems of the body and is therefore of use to both men and women. particularly when irritability and mood swings are prominent. Its cooling influence may also benefit women as they have hot flashes going through menopause. Shatavari is beneficial in cooling off an irritated digestive system as expressed by heartburn, diarrhea or irritable bowel syndrome. It can also be helpful to soothe irritation in the urinary tract. Men may benefit from the herb as well in the treatment of impotence. A Great way to start your day Every morning, on an empty stomach, drink a cup of warm water with 1/2 of a lemon or 2 to 3 Tablespoons of lemon juice. Add 1 Tablespoon of honey. The great benefits Warm water helps in clearing the digestive system by washing away residual undigested substances in the intestine, stimulating better digestion in the process. It helps in flushing out toxins from the body. Lemon’s benefit lies in its cleansing quality. It is very effective for cleaning the digestive tract thus facilitating better digestion and ultimately weight loss. Also, lemon is rich in vitamin C which helps prevent cough and cold. The honey, contains enzymes that improve metabolism.That helps the body breakdown food better and absorb nutrients and faster conversion of stored fat into energy. The best time to drink your morning coffee for the best benefit is actually 10:30 AM. Normally, cortisol levels rise during the early morning hours and are highest about 7 a.m. They drop very low in the evening and during the early phase of sleep. So by 10:30 the cortisol levels have dropped and that cup of coffee with help. Cortisol has many functions. It helps the body use sugar (glucose) and fat for energy and it helps the body deal with stress . Cortisol levels can be affected by many conditions, such as physical or emotional stress, strenuous activity, infection, or injury. It found that higher vitamin C intakes were associated with a lower likelihood of a wrinkled appearance, dryness of the skin, and a better skin-aging appearance. Vitamin C is also needed to help regenerate Vitamin E, which is needed for healthy immunity. Vitamin C is one of the nutrients sensitive to stress, it is the first nutrient to be depleted in alcoholics, smokers, and obese individuals, it makes it an ideal marker for overall health." Vitamin C can enhance the absorption of iron when the two are eaten together. Growing up your Mom would tell you eat your peas! And like most kids you did not like them. I remember my youngest brother eating them like he was taking pills. It was painful to watch as he would take a mouth full of water and only a few peas in his mouth as he would try to swallow them whole. He would continue this grueling task till the pile of peas on his plate were gone. My other brothers and I would laugh at his funny tradition. The funny thing is if he ever tried them he would have realized they were tender sweet morsels fresh from the garden. Now as an adult he actually enjoys eating his peas and we will now see if his sons are like him and don't eat their peas. 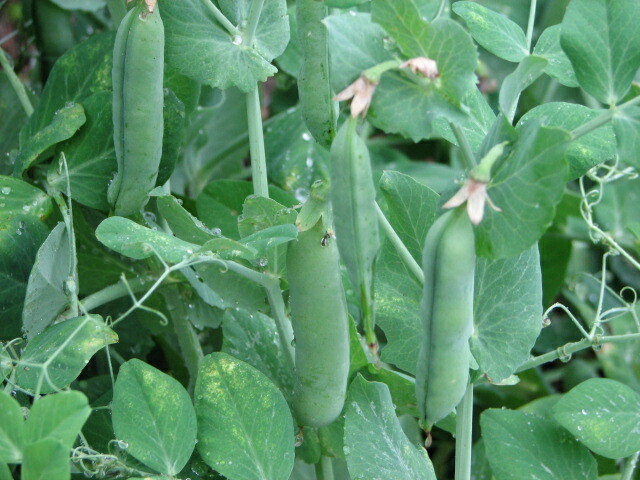 There are many varieties of peas. Peas date back as far back as the biblical days. Peas are rich in Vitamin B and folate, which are important for in proper metabolism of fats, proteins and carbohydrates. They also provide antioxidant protection. Bake at 450 in the oven for 6 to 8 minutes, until tender but firm. Dry brittle nails can be a result of a deficiency in iron. Foods that are rich in iron are eggs, spinach and fortified cereals. If you pair them up with Vitamin C rich foods such as citrus, bell peppers, and tomatoes it will help the body absorb the iron. For brittle flaking nails include more fatty acids in your diet to moisturize the nail beds. 2 Tablespoons of flax-seed oil or flax-seeds is an easy addition to your diet. Your finger nails can tell a doctor a lot about your overall heath. Many illness can be found by inspecting a persons fingers. The answers to your health problems could be found at the tip of your fingers. These gems are great anti inflammatory and for detoxification. These colorful root vegetables contain powerful nutrient compounds that help protect against heart disease, birth defects and certain cancers, especially colon cancer. These vegetables are rich in antioxidant carotenoids, and in particular, beta-carotene. The nitric acid in beets increases the blood flow in your body including the brain that are associated with degeneration and dementia. Eating beets raw packs more nutrients. A great way to eat them raw is by juicing at adding them to a salad. vinegar and seasonings. Pour over vegetables and toss to coat.